I had the pleasure of attending a meeting on the WISER commons last Friday (December 1st) in Seattle Washington. It was a great meeting bringing together environmentally minded individuals and organizations that have a common “technology” thread. The event was sponsored by the Interra Project and the Natural Capital Institute. 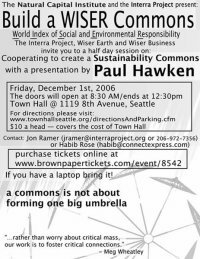 Paul Hawken spoke about the need and relevance of a “commons” and promoted a new project called WISER. The demo shown was an impressive database of socially responsible organizations around the world. I am excited to see this project grow as it is aiming to socially connect the environmental movement. I am interested to tear into their code as the software being developed is Open Source and should be interesting. They are due to put out a public release in January!